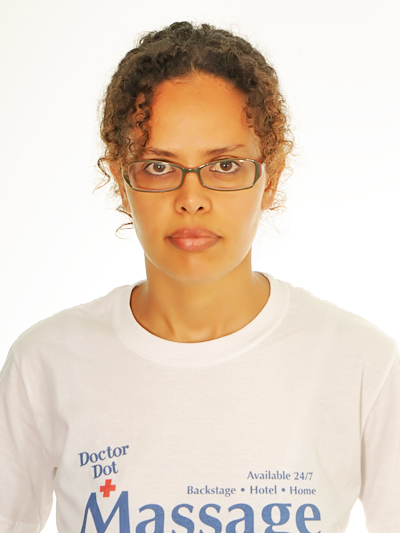 Hi, I am Erica, I was born in Ethiopia and I have a Swiss and Eritrean heritage. I grew up in Rome and after completion of my studies I headed off to Spain where I lived for 11 years. My passion for massage began in the colourful and cosmopolitan city of Barcelona. In 2000, I obtained a "Therapeutic Massage" diploma which included Hand Massage, Foot Reflex zone massage and Lymphatic drainage training. After that, I gained practical experience working in a Spa where I learnt to use Aromatheraphy: a massage technique which uses essantial oils to heal the body and the mind. I continued working in Wellness Centres, Spas and Hotels for over twelve years both in Spain and in Italy, gaining expertise. I love my job and I love making people feel better through the energy of my hands, in fact, clients often say that I am a natural healer. Practicing yoga regularly and being a vegetarian help me in my job. I couldn't live without music, It's like a best friend to me! I love concerts, traveling, walking and most of all I love my beautiful daughter! I am happy to be a part of DrDot. Team and I'm looking forward to my next massage!